It’s easy to see why the nation’s largest contractors prefer ISAT. Seismic bracing solutions for professional engineers, architects and more. Seismic compliance for building owners. Protect your facility and it’s components. ISAT actively works with building officials, inspectors and jurisdiction authorities. Reduce the risk of costly litigation and financial losses from a seismic event. ISAT is the choice of professionals for nonstructural seismic bracing products and services. Custom seismic seminars worldwide, designed to meet the needs of any company. ISAT provides seismic design and coordination for 2D drawings and 3D BIM. Let ISAT provide a complete project estimate for any of our services and solutions. ISAT provides streamlined seismic retrofitting methods that professionals trust. Explore ISAT’s extensive seismic engineering services for all MEP & F trades. Leading edge "Fast Track" and "Compressed Schedule" construction projects. Established in 1977, ISAT has grown to be a global leader in design, consulting and supply of "Accelerated Schedule" commercial construction projects. Serving all market segments: healthcare, industrial, military, commercial, see full list. ISAT has been involved with some of the most complex projects across the globe. Read why professionals worldwide are choosing ISAT or write your own. With over 15,000 completed projects, we own the experience! Visit Gallery. Learn about ISAT’s seismic seminars, online or on-site by request. The best support from start to finish. Learn about ISAT’s on-site training. Learn more about seismic code compliance from the comfort of your chair. Explore ISAT’s collection of valuable code information for IBC, CBC & much more. Explore code adoptions by state,determine your seismic requirements and more. Explore ISAT’s resources, industry articles, FAQ’s, industry news and links. Click to watch the FREE International Building Code (IBC) seismic seminar for distributed utilities. Patented labor savings pre-poured concrete anchoring inserts. In depth, pre-engineered seismic design solutions for distributed utilities MEP & F.
Kits are pre assembled for each specific location on your project. Complete line of strut, pipe hangers and support devices delivered worldwide. Your single source solution for all vibration isolation and seismic requirements. ISAT’s streamlined prefabrication services will maximize cost reduction. See why building experts worldwide use ISAT for their most complicated projects. We’re always looking for unique individuals to grow with our team. Apply today. Follow ISAT news to keep up with the industry’s latest events and technology. Connect with us wherever you are through social media,email,apps,and more. >> ISAT Worldwide Locations << ISAT Seismic Bracing Products and Services - We make it easy! 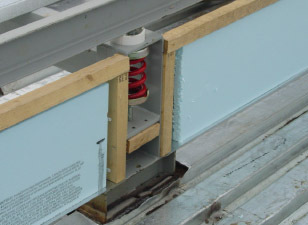 Rooftop Vibration Isolation Rails and Curbs. ISAT and Kinetics rooftop vibration isolation rails and curbs. There is NONE BETTER for Engineering services, manufacturing and testing capabilities - all backed by the industry’s most experienced staff. 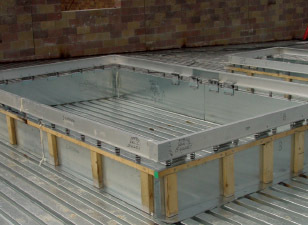 Kinetics KSR Isolation Rails are the next generation isolation system designed and engineered to isolate packaged rooftop equipment from the roof structure while providing seismic and wind restraint. Designed for easy installation, minimum interference with equipment overhang, the Kinetics KSR goes well beyond internal isolation by reducing casing radiated vibration caused by turbulent air flow as well as compressor and fan vibration. 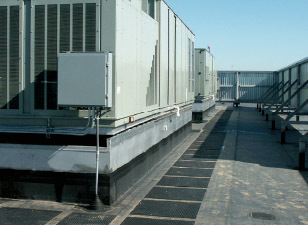 Affordable, easy-to-install, all-in-one roof curb AND vibration isolation packaged rooftop units! KSCRs are limited to units up to 20’ in length and weighing up to 12,000 lbs. 1” or 2” deflection, powder-coated steel springs with 50% overload capacity are available. Standard features include internal seismic and wind restraint,supply and return support hardware and EPDM air and weather tight seal. 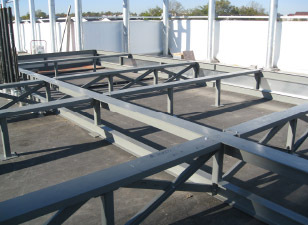 Complete curb system with internal seismic and wind restraints for rooftop equipment. Curb can be made to accommodate a variety of height and slopes. Optional accessories include, insulation, duct supports and noise packages. Heavy-duty, complete vibration isolation curb for the BIG rooftop unit jobs! Code compliant seismic & wind restraint, access ports for each isolator to inspect, level, or change springs after equipment placement. Up to 4” deflection, powder-coated steel springs with 50% overload capacity. High-frequency noise isolation pads. Click to learn about ISAT's Vibration Isolation engineering services. With Over 15,000 Completed Projects, We Own the Experience!